Driving in an unknown neighborhood can be a tricky thing. None of the street names are familiar and the thought of getting from here to there not only seems impossible, but likely won’t happen. While we were in Hawaii, we were completely reliant on Siri, our phone map guide. We let her know where our destination was and then she politely and calmly told us exactly where to go. There was a time or two we got distracted, talking over her and would respond too late, driving round and round the round-abouts trying to figure out which one was the “third turn, but when we listened, we headed in the right direction. I wish God was a little more like Siri. Wouldn’t it be nice to plug in a life destination and then have Him calmly spouting out directions? In 3 years, marry the man sitting in front of you in your college calculus class. In 2 years, start your family by trying to conceive on the 3rd day of April. In 2018, when a new job opportunity crosses your path, decline it, as that company will close 4 months after. Unfortunately it’s not always that easy. I’ve been part of some great conversations diving into the concept of figuring out what God’s will is. Isn’t it easy to wonder if we are about to take a wrong turn, if we are responding too late, or if we are right on track to our destination? If you are anything like me, it can be a little overwhelming at times trying to figure out exactly what is THE right direction. God, how do I get THERE from HERE? So God isn’t exactly like Siri, but I do see some correlation with a few take away lessons here. The first is that we have to stop and take time to listen before acting. When I rush through my route, assuming I know what she’s going to say, I tend to go the wrong way. Same goes with God. When I start to veer off and do my own thing assuming I know what His direction is, I tend to miss key things. We can’t always plan the unexpected detours. Sometimes we think we have the plan, but then something comes up. A road might be closed, the lights might be out, or that McDonald’s on the wrong side of the road is calling. (Mcfluuuurrryyyyy). There are always those detours in life too where no planning would have ever prevented the delay. That’s when we just go with it. Follow the rerouting direction, even if it seems like it’s not right. It may take us a few minutes longer to arrive, but even if it’s a few extra minutes, a couple more stop lights and the detour seemed ridiculously out of the way, we will still arrive. We need to trust that God, our ultimate Siri, is going to have our backs in all of this. We don’t have to worry about HOW we are going to get from point A to B because He goes with us. Sometimes when Josh and I are heading out somewhere, we both have different routes in mind. We get to the first stop light and he puts on his left turn signal while I shout “Go right!”. Both routes will take us to the same place, and have their pro’s and con’s. Maybe we would pick one way or the other if we knew about the accident that was about to happen or the power outage that would send the lanes into a snail paced mess, but neither of us are wrong. We would arrive either way. Then there are the times when we don’t know where we are going and plug the new address in. Siri will offer us 3 different ways to get there and we evaluate our options, look at the traffic and travel times and go with what seems best. Isn’t that what happens in life too? Should we adopt, continue treatments or settle into a child-free life? Should I take that job, stay at this job or apply elsewhere? Should we move to that neighborhood or stay in one? In all things, let’s pray about it, evaluate our options, and then trust Him. God honors our intentions to choose the right, God-honoring path in life. Regardless of whether they are the “best” long term, He works with it, rerouting as needed. Is our stress over making the “wrong decision” overtaking our decision to simply please God with what we do? And where is the stress rooted – in not being immediately blessed with an answered prayer or displeasing God with our decision? What’s taking over your heart today and how can you trust that when you turn to Him, He will guide you? “We know that in all things God works for good with those who love him, those whom he has called according to his purpose.” (Romans 8:28 GNT) God’s going to reroute you accordingly if needed, direct your steps and guide your lives. It’s up to us to trust Him, allow Him to guide us, and stop talking long enough to hear His voice. Sound good? Omg what an interesting thought. It would be crazy if we had a real-life Siri, who knows if we’d actually listen though. Great post! Anyway, thank you SO MUCH for your wonderful blog. I stumbled upon it a few days ago and have been enjoying it IMMENSELY as I trudge through our second round of IVF (1st round ended up being a “failed cycle” due to OHSS). Just a moment ago, I got a text from my doctor’s office saying that my trigger shot will most likely be tonight (surprise!) and my retrieval on Sunday. I am super excited (and nervous, and relieved) but it is truly reassuring to know that, even though nobody around me understands, I am not alone on this wild ride. Our journey with infertility has certainly been a struggle, but a blessing, too. What a great thought. There are days where I wish I had a road map to my life, but then there are times where the unexpected is a wonderful surprise. I just keep moving forward with the faith that god knows my ultimate destination. I absolutely love this post, Chels! I’m struggling with uncertainty lately regarding some big choices on my TTC journey. My doctor tells me this is what we need to do but is that the same path God has for me? How great would a road map be right now! I’m always praying for God’s direction for me and all of my TTC sisters!! Have a wonderful weekend. This is my favorite verse :) It would be great for God to have our plan laid out and let us know each step along the way but I have a feeling, just like I do now, I’d probably still question it ya know? 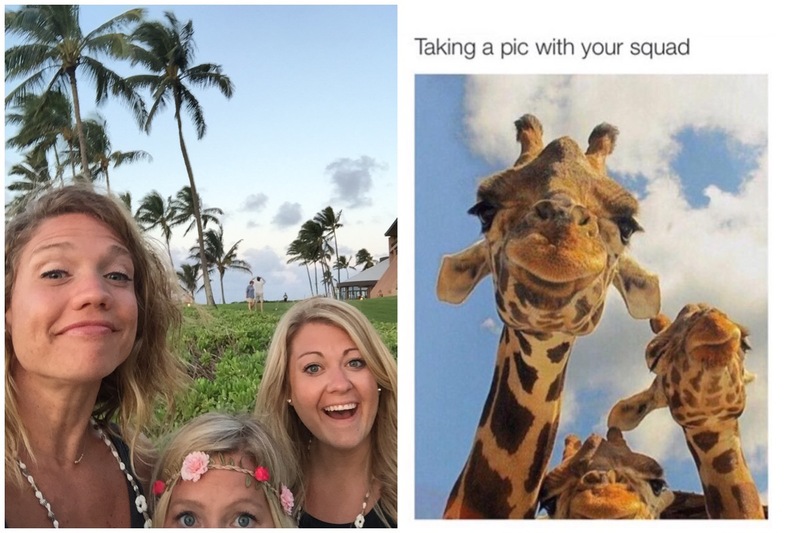 Those giraffe’s are too cute! !